Of the thousands of pages of official documentation that have surfaced on the subject of UFOs under the terms of the U.S. Government�s Freedom of Information Act, references to the Roswell and New Mexico UFO crashes of 1947 are few and far between. But they do exist. One such example is an FBI Teletype of 8 July 1947. On 10 July 1947, Brigadier General George F. Schulgen (Chief of the Requirements Intelligence Branch of Army Air Corps Intelligence) met with Special Agent S.W. Reynolds of the FBI with a view to determining if the Army Air Force could solicit the assistance of the Bureau on a regular basis in its investigation of the UFO mystery. Declassified FBI memoranda shows that the Bureau had been monitoring the UFO subject on an ad hoc basis in the wake of the Kenneth Arnold sighting of 1947. It was this meeting between Schulgen and Reynolds that cemented the way for a short-lived liaison between the FBI and the military in the investigation of UFO reports. Only forty-eight hours before this now-historic meeting took place, however, the FBI was briefly implicated in what is certainly the most-talked about UFO incident in history � Roswell. On 8 July 1947, the FBI office at Dallas forwarded a 1-page teletype message to FBI Director, J. Edgar Hoover, concerning the events at Roswell. It is evident, however, that the FBI was in possession of only half the story. That �half� having been supplied sometime previously by Major Edwin M. Kirton (name deleted on the FBI record originally released in 1976) of Army Air Force Intelligence at Fort Worth, Texas. On 5 December 1950, the FBI was informed by Army Intelligence at Richmond, that the military had �been put on immediate high alert for any data whatsoever concerning flying saucers.� This was one day before, according to the MJ12-Eisenhower Briefing Document, a UFO crashed at El Indio-Guerroro area of the Texas-Mexican border. On 30 November 1988, an arranged meeting took place between representatives of the FBI and the Air Force Office of Special Investigations in Washington, D.C., to discuss the MJ12 papers that were in the public domain at that time. The Air Force informed the Bureau that the papers were bogus. This is borne out by the fact that any requests to the FBI for information pertaining to MJ12 will result in copies of the MJ12 papers being dispatched to the requester with the word BOGUS written across them in heavy ink. The AFOSI has stated in response to FOIA requests that nothing was committed to paper on their part with respect to this meeting and they concede further that they undertook no investigation into the authenticity or otherwise of the MJ12 papers, which begs an important question. How was the Air Force able to inform the FBI with confidence that the MJ12 papers were �bogus� if they had conducted no investigation into their contents? Two of the premier investigators of the Roswell crash � Stanton Friedman and William Moore (who co-wrote the book, The Roswell Incident, with Charles Berlitz) have been the subject of FBI investigations. In the case of Moore, by 1993 the FBI file on him was running at 61 pages, of which Moore was able to gain access to only six. As all of the above information shows, the Roswell Incident and the FBI have at various times between intimately connected. How much more information pertaining to Roswell, MJ12 and the many and varied investigators that have researched the case and that remains unseen outside of official circles is unknown at this time. Perhaps the most important document ever released in Canada is the Top Secret memo of November 21, 1951 from Wilbert B. Smith, senior radio engineer with the Canadian Department of Transportation. Smith was a highly respected employee, with a Masters degree in Electrical Engineering and several patents to his credit. The memo was sent to the Controller of Telecommunications and recommended that a research project be set up. "We believe that we are on the track of something which may well prove to be the introduction of a new technology," Smith wrote. The entire matter is considered by the United States authorities to be of tremendous significance. Here is an unarguable link between Vannevar Bush and UFO reverse-engineering which the Majestic documents describe. This 30-page FOIA release of a formerly Top Secret "Project Silver Bug," developed at Wright-Patterson AFB, was made to Tim Cooper in October '97. All the "release information" is printed on the cover page for the reader to see. This "saucer" designed aircraft uses "gas turbine engines," a conventional power source. The report is a preliminary design document that includes sectional drawings, performance characteristics, weight breakdowns, control systems, and problem areas. This 1955 report does, however, fit into another story relating to U.S. Air Force interest in testing saucer designs. According to a now retired AF Lt. Col., in 1954, while a 2nd Lt., he and a few other 2nd Lt.'s came across a table full of "wind tunnel test model saucers" while in a wind tunnel test building of Area "C," Wright-Patterson AFB. It is illogical to assume that USAF as well as foreign militaries do not have modern versions of this type of craft. Some have argued that reported UFOs are U.S. government or even Nazi experimental craft. However, those arguments can't account for the extreme maneuverability and accelerations seen in UFO reports. The right angle turns, the over the horizon disappearances in seconds; no conventional power source could provide the performance characteristics described. President Kennedy signed this declassified memo dated 12 November 1963. It is a National Security Action Memorandum (NSAM) No. 271 directed to the administrator of National Aeronautics and Space Administration (NASA), James Webb. The subject matter is surprising, namely �Cooperation with U.S.S.R. on Outer Space Matters.� It opens with, �I would like you to assume personally the initiative and central responsibility with the Government for the development of a program of substantive cooperation with the Soviet Union in the field of outer space, including the development of specific technical proposals. I assume that you will work closely with the Department of State and other Agencies as appropriate.� It goes on to mention: ��broader cooperation between the United States and the U.S.S.R. in outer space, including cooperation in lunar landing programs. �In this connection the channel of contact developed by Dr. Dryden between NASA and the Soviet Academy of Sciences has been quite effective, and I believe we should continue�� This memo cross checks with a Top Secret memo of the same date that is part of the leaked Majestic documents cache (John F. Kennedy to CIA, November 1963) which states that with the joint cooperation efforts, make sure to explain in a credible way the impact of knowns (terrestrial aircraft), and unknowns (UFOs). This NASA document written in 1965 is titled "Concepts for Detection of Extraterrestrial Life" (NASA SP-56). This copy was released from the U.K. via Nick Redfern. Note the stamps on the cover that mention the University of Warwick and A. V. Roe & Co. Ltd. Weapons Research Div. Woodford, Wilkshire. This FOIA response to Richard Hall dates 25, September 1980 clearly confirms the existence of the Interplanetary Phenomenon Unit part of the Scientific and Technical Branch of the Counterintelligence Directorate was disestablished during the late 1950�s and allegedly never reactivated. Their files were surrendered to the Air Force Office of Special Investigations (AFOSI). This Top Secret UMBRA document, specifically Civil Action lawsuit No. 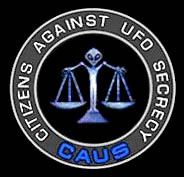 80-1562 Citizens Against UFO Secrecy (CAUS) versus the National Security Agency (NSA) clearly confirms deep and widespread government involvement with UFOs. This document was released and declassified as a result of a FOIA process and shows numerous blackout areas related to COMINT (communications intelligence) and SIGINT (signals intelligence). This in camera affidavit for Judge Eugene F. Yeates is simply a justification by the NSA to withhold the information that CAUS was seeking. Furthermore, the key agency or organization that performed the analysis and search is blacked out. This two-page memo is a response to William Steinman�s original memo of 18 May 1983 in which Steinman names nine scientists that took part in the 1948 UFO crash retrieval 12 miles Northeast of Aztec, New Mexico. Dr. Sarbacher, of the Washington Institute of Technology, confirms that John Von Neuman, Vannevar Bush, and Robert Oppenheimer were definitely involved. The letter goes on to state: ��certain materials reported to have come from flying saucer crashes were extremely light and very tough. I am sure our laboratories analyzed them very carefully� I remember in talking with some of the people at the office (Pentagon) that I got the impression these �aliens� were constructed like certain insects we have observed on earth�� The reality of the Aztex crash is not well established. This letter dated May 16, 1984 from Lt. Col. Lance R. Cornie to William S. Steinman provides more official evidence that the Interplanetary Phenomenon Unit (IPU) did exist and that their records were transferred to the Air Force. The memo is suspicious in its categorical denials and claims based only on "institutional memory." For example, it states that "It was never a 'unit' in the military sense, nor was it ever formally organized or reportable, it had no investigative function, mission or authority and may not have had any formal records at all." Yet the unit "was formed as in-house project purely as an interest item of the Assistant Chief of Staff for Intelligence." Note that from 1941 to the late 50's when it was allegedly disestablished there have been many Assistant COS-G2, most of which have been directly linked to the MJ-12 program, such as Stephen J. Chamberlain or George C. McDonald. This 3-page document, titled Somaliland President Egal Speaks on Mysterious Bomb Blast, dates from January 1996 and concerns a series of "mysterious explosions" that had occurred in the same month and year in the eastern part of Somaliland. The report (that originated with the CIA and that was forwarded to the State Department, Defense Intelligence Agency and Wright-Patterson Air Force Base among others) states that in some quarters the explosions had been attributed to UFOs. Interestingly, the document also states that the physical and mental health of both animals and people in the region had been adversely affected by whatever it was that had exploded. Symptoms included dementia, skin rashes, boils on the skin, aching stomachs, and skin shedding. The document states that the object that crashed or exploded was moving at supersonic speed but due to the size and remoteness of the area, a search for debris had been unsuccessful. The reference to people having physical reactions is not unlike the references in the Majestic 12 1st Annual Report and the Interplanetary Phenomenon Unit document about individuals having adverse (and fatal) reactions to an alien virus at the scene of a UFO crash site in 1947. A one-page Department of Defense document dated 18 January 1967 discusses a UFO incident at Agadir, Morocco, and again makes a clear and undeniable link between UFO studies and Project Moondust investigations. It states in part: "�this sighting demonstrates a high level of local interest in the subject of UFOs and presages future reporting which could be valuable in pursuit of Project MOON DUST." A one-page Department of Defense document dated 6 April 1967 and titled UFO Sighting at Kasba Tadla, Morocco makes a clear link between UFOs and Project Moondust. In part, the document states that: "�it indicates continued local interest in UFOs" and directly references Project Moondust as being relevant to the investigation. Additional documentation demonstrating a link between UFOs and Project Moondust comes via a package of 42 pages of documentation that were all released as a result of a Freedom of Information Act request to the State Department for files on Moondust. The first entry is titled Project Moondust and dates from November 1973 and concerns the recovery of what may have been Soviet satellite debris. However, also included in this 42 page package are: (a) documents on a 1978 discussion concerning the potential of having the United Nations undertake UFO investigations; (b) UFO sightings in Afghanistan; (c) a UFO encounter in Kuwait in 1980 that "shut down" the pumping system of a local oil pumping device; (d) the recovery of a spherical object in Buenos Aries in 1984; and (e) a 1984 report titled Unidentified Objects Observed on Radar Screen at Grantley Adams International Airport. These 2 pages of documentation were forwarded to the State Department by the CIA and detail the crash of "an unidentified object" in Bolivian territory in May 1978. The object was reportedly 4 meters in diameter and Bolivian authorities had sealed off an area of 200 km around the crash site. In April of 2007 Air Intelligence Agency, part of the US Air Force through the Freedom of Information Act (FOIA) confirmed that in August 1979 a pair of weird spheres crashed near Santa Cruz, Bolivia. The documents not only verify what Ryan S. Wood has already revealed in his book Majic Eyes Only, but also provides additional intriguing details and references to �MOON DUST,� the prominent governmental space debris and UFO retrieval program designed to locate, recover, and deliver descended foreign space vehicles back to Wright Patterson Foreign Technology Division headquarters for analysis and exploitation. According to several eye-witnesses, two �balls of fire� fell from the sky and softly landed in the cities of Santa Cruz and Cotoca on August 8th, 1979. The story behind these fallen objects is continuously growing with intensity and credibility. The spheres�almost identical in nature�were about �80 centimeters in diameter and ~2 meters in circumference with a hole in one side and a metal skin covering approximately one-half inch thickness�The spheres weighed about six kilograms with half-inch thick skin and the outside metal was similar to copper with dark and light spots �the plants near the objects were burned.� First hand witnesses mentioned in the official documentation of this incident include Colonel Ariel Coca, Campesino Gonzalo Menacho Viveras, and Nathaniel Mendez Hurtado. Most of the mystery associated with these incidents is in the practically impossible landing of these objects. The two objects were reported to be on fire, made a loud whistling sound and then exploded. However, �in the area where they�ve been found, there were no signs of the impact and it looks as though the spheres landed smoothly.� How did the spheres negotiate a smooth landing? Certainly they are not terrestrial space debris. More mysterious yet, is the presence of a �silent aircraft� with three lights that appeared later the same evening, hovering above the explosion area. What was the craft doing? Who contracted it to be there and why? Was it an extraterrestrial craft or man-made? The incidents� association with project MOON DUST intensifies these questions; what was the level of involvement of MOON DUST personnel and what did they hope to gain or hide in Bolivia? Where are the spheres today?